The London School of Hygiene and Tropical Medicine (LSHTM) has a research grant from AusAID for a project working on WASH access for people with disabilities in Bangladesh and Malawi. The aims of the project are: i) to develop tools for assessing WASH access for people with disabilities; ii) to generate data on the prevalence and nature of WASH access problems for people with disabilities and iii) to provide guidance on some aspects of potential mitigation strategies. Additionally, the project has a communication and engagement component to engage and inform stakeholders about the project process and findings. The overall research strategy is to carry out data collection in the context of an intervention to improve the inclusiveness of WASH programmes. Over the last few months, observations of standard CLTS, including pre-triggering, triggering and follow-up, were documented by researchers from Mzuzu University Centre of Excellence in Water and Sanitation. 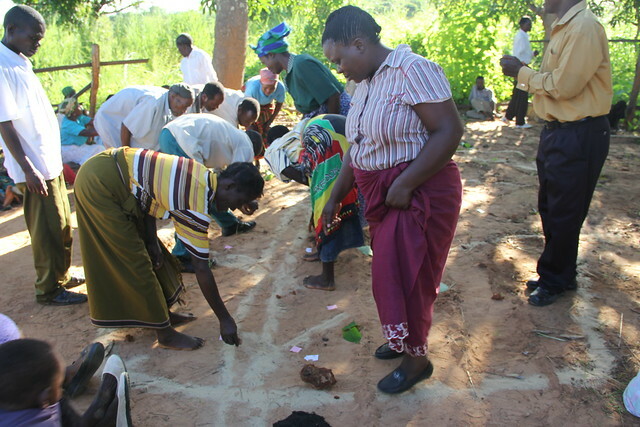 This week in Rumphi, Northern Malawi, Hazel Jones, of Water, Engineering & Development Centre (WEDC) provided training and support for inclusive WASH programming. The training included people with disabilities, NGOs, extension workers, and Government officials. The next phase involves observations of this new CLTS with inclusive WASH programming, including pre-triggering, triggering and follow-up, to again be documented by researchers from Mzuzu University Centre of Excellence in Water and Sanitation and further comparison to standard CLTS. Thanks for letting us know about this project on WASH access for people with disabilities in Bangladesh and Malawi. It is not clear to me how the CLTS work is integrated into this project, is it a central component or just one of several avenues? Could you please provide me with the relevant information (project title, organisation, duration and website link(s))? Then I could easily include it in the database. That would be great. Thank you for your message about the CLTS with inclusive WASH programming happening in Rumphi, Malawi and Bangladesh. In Malawi, for this project, in April we had a training workshop given by WEDC in which an action plan was developed to ensure when CLTS is delivered it is capturing needs of people with disabilities. CLTS is the central component of the project, with this new action plan to bring awareness to needs of people with disabilities as an avenue for inclusive sanitation. We are currently in a phase to make observations of this new CLTS with inclusive WASH programming in the field as it is being implemented, including pre-triggering, triggering and follow-up, to again be documented by researchers from Mzuzu University Centre of Excellence in Water and Sanitation and further comparison to standard CLTS. This work is separate, but complementary, to the Global Sanitation Fund work happening in Malawi. Thanks for this information. I have now included your project in our project database, too. Rochelle, I look forward to following your progress with this project on CLTs and inclusive WASH programming in Malawi. Last Edit: 24 Jun 2015 09:42 by muench. You may be interested in a recent publication from a research project in the north of Malawi that focused on improving water, sanitation and hygiene access for people with disabilities. Community-led total sanitation (CLTS) is a common method for promoting sanitation in low-income settings. This cluster-randomized trial evaluated an intervention to improve inclusion of people with disability in CLTS through training facilitators. A qualitative study examined intervention acceptability. The trial included 171 disabled people (78 control and 93 intervention) living in 15 intervention and 15 control communities. In the intervention arm, respondents were more likely to participate in a community meeting about sanitation (+18.7%, 95% confidence interval [CI]: 3.2, 34.2) and to have been visited to discuss sanitation (+19.7, 95% CI: 0.6, 37.8 ). More intervention households improved latrine access for the disabled member (+9%, CI: −3.1, 21.0). Inclusive CLTS could improve sanitation access for people with disability but requires support to households beyond that provided in this trial. Last Edit: 18 Feb 2018 15:41 by muench.